I went to hear Octavia Butler speak when her novel, Parable of the Sower was released. This was before she won the MacArthur Genius Grant. The thing was, at that time, she didn’t read. Always self-deprecating to a fault, Butler instead gave a talk about her work and writing the process, and at least to me, that was as enthralling as any recitation could be. She told a story about how she had been stuck with writing her current novel at one point, so she went for a walk to buy some food at a supermarket. Butler lived in Southern California at the time, and she wasn’t a driver—a rarity, if you’re at all familiar with greater Shangri-L.A.
She paid for her purchases with a $100 bill. The cashier stopped the process, and called over a manager. Apparently, there had been a rash of counterfeit 100 dollar bills floating around the area, and they needed to confirm that the bill was legitimate. The store took the necessary steps, and Butler walked out of the store with her groceries. She wasn’t too far from the store when a phalanx of police cars converged on her—she described it as more than two cars, with their engines whirring. She stopped, and they detained her in the store’s parking. The officers explained the counterfeit issue again. Butler asked why the police had been called, since she had already paid and been cleared by the store’s management. The reason was, she looked suspicious. Butler was a tall black woman (she might have been 6 feet tall) and walking along the side of the highway in L.A.. That had been a red flag for the store’s owners. The audience listened to this story in quiet shock. 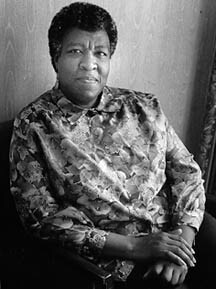 Octavia Estelle Butler, one of the greatest SF writers ever, had been racially-profiled! Butler, being a writer, saw this incident as important, and it influenced Parable of the Sower’s sequel, Parable of the Talents. Racial profiling is something that many African Americans face. It’s a fact of life. My 83-year old mother, an ABD (all but dissertation) Ph.D, was recently mistaken as a waitress in her retirement community home. It can be used as a justification to kill, if you tell a certain narrative. The Martin case, like the Rodney King case before it, exposes an issue faced by black male youth. Butler used her experience to create a masterwork of speculative fiction. I hope that the Martin case can be used as a springboard to stop profiling and murder, bring justice to everyone.